The late Robin Williams will go down as one of the most celebrated and deeply loved actors of all time. He made so many classic and immensely popular films, and everyone has a favorite or two. Watching him work is a master class in comedy, particularly in movies like Mrs. Doubtfire, The Birdcage, Popeye, and Good Morning, Vietnam. Williams wasn't just a comic actor — he could do it all, including unsettling thrillers like One Hour Photo, tearjerkers like Patch Adams, and affecting dramas such as Good Will Hunting, which won Williams an Academy Award. Of course, let's not forget his silly early work as an alien on Mork & Mindy, or how his performance as the Genie in Aladdin was a game-changer for voice acting. But Williams' natural state just might have been throwing the script away to do a little riffing. He got his start in stand-up comedy and he never gave up his tendency to ad-lib, coming up with voices, jokes, naughty humor, impressions, and whatever else popped into his agile mind. Here are some moments when Williams was at the absolute top of his improvisational game. Even by the late 1980s, Americans were still trying to make sense of the Vietnam War. Comedy can be a coping mechanism, and that's where Barry Levinson's Good Morning, Vietnam came in. The 1987 movie starred Robin Williams as Adrian Cronauer, based on a real-life guy of the same name, a wild and crazy disc jockey on Armed Forces Radio in the middle of the Vietnam War. He angered his superiors by not only playing rock n' roll and R&B records, but by speaking out about the futility and heartbreak of war. The drama of wartime is definitely cut with Williams' presence, especially his motormouth scenes talking about the escalating conflict, the news, himself, and the music. They feel just like a real DJ's ramblings, and to maintain that authentic feel, Williams had free reign. "When he sat down in the control booth to do the scenes involving Cronauer's broadcasts," producer Mark Johnson said in the production notes for the film, "we just let the cameras roll. He managed to create something new for every single take." A fear of public speaking is very common, and people dread it in part because of something going wrong. What if you're giving your big speech in front of hundreds of people when the equipment fails and you're left on a stage with a restless audience staring at you? That worst-case scenario became a reality at a 2008 TED Talk. The presentation on new media was being recorded for the BBC. Matt Frei, a presenter for BBC World, hadn't even finished introducing panelist Sergey Brin of Google when he had to stop due to what a Wired reporter in the audience called a "technical issue." Frei tried to vamp and make jokes — he said his producer was feeding him via earpiece a political joke about Poland — before a heckler started in on him. Pretending to be a reporter covering the TED Talk live, he screamed about not being able to "understand a f***ing word" and wondering aloud why "at a technology conference everything is running so [expletive deleted]." The audience broke into laughter when they realized that the heckler was Robin Williams. The speakers brought him up on stage, where he delivered an impromptu ten-minute routine about TED Talk-worthy topics, such as Stephen Hawking and the eventual death of the universe, which Williams said would happen in "exactly in one hour." Good Will Hunting undoubtedly boasts a fantastic script. Stars Matt Damon and Ben Affleck wrote it to give themselves great roles, and they did just that with this touching, poignant story about a Harvard janitor turned math genius. They won Best Original Screenplay at the 1998 Academy Awards, and yet the film's most memorable scene came courtesy of their co-star, Robin Williams. Williams won an Oscar for his role as Dr. Sean Maguire, a psychology professor and therapist to Will Hunting (Damon), deeply mourning his wife. In a therapy session, Sean talks about her, bringing up a memory both hilarious and intimate — how she'd fart in her sleep so loudly that she'd wake herself. On the Good Will Hunting DVD commentary track, Affleck and Damon revealed that Williams made up the monologue on the spot, and that Damon's uproarious laughter is genuine (as is the cameraman's — the frame visibly shakes he's laughing so hard). With the exception of the scene where he talks about his farting wife, Good Will Hunting contains one of the most subtle and quiet performances of Robin Williams' career, a far cry from the childlike antics of Mork from Ork. Still, according to his costars, he winged it like mad on the set. At a Tribeca Film Festival event in 2015, director Gus Van Sant explained that while the crew would figure out the technical specifications for a shot, the actors would rehearse their dialogue. "Robin would do his part as Janet Reno," he revealed, "and Matt [Damon] would do his part as Daffy Duck." In another practice take, Williams did his lines as Frankenstein. But one significant bit of Williams' off-the-dome dialogue did make it into the finished film. Good Will Hunting ends with Will (Damon) leaving town to pursue Skylar (Minnie Driver). He leaves a note for confidant Dr. Sean Maguire (Williams) that reads, "I gotta go see about a girl," echoing a line the doctor had said earlier. Williams was just supposed to read the note and look proud and satisfied, but he added in the punchline, "Son of a b****, he stole my line." Damon told Boston Magazine it's "Robin's best addition" to the movie. When you absolutely have to be awake at a certain time — like when billions of dollars' worth of equipment and your very life depend on you being bright-eyed and bushy-tailed — you'd use a loud and effective alarm clock. 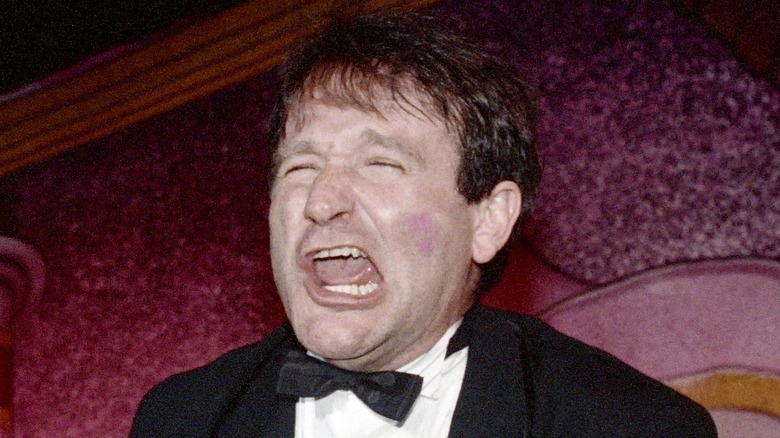 No buzzer could wake someone up like the booming, familiar voice of Robin Williams bursting into a comedy routine. In 1988, NASA asked him to make a wake-up call to the crew of the space shuttle Discovery, the first shuttle flight after the 1986 Challenger tragedy. "Gooood morning, Discovery!" Williams shouted, alluding to his similar catchphrase from Good Morning, Vietnam. "Rise and shine, boys. Time to start doing that shuttle shuffle. You know what I mean." Then NASA cut to a pre-recorded comic song, a parody of the Green Acres theme song with lyrics about space. The song isn't that funny — they should've just let the clearly thrilled Williams keep going. 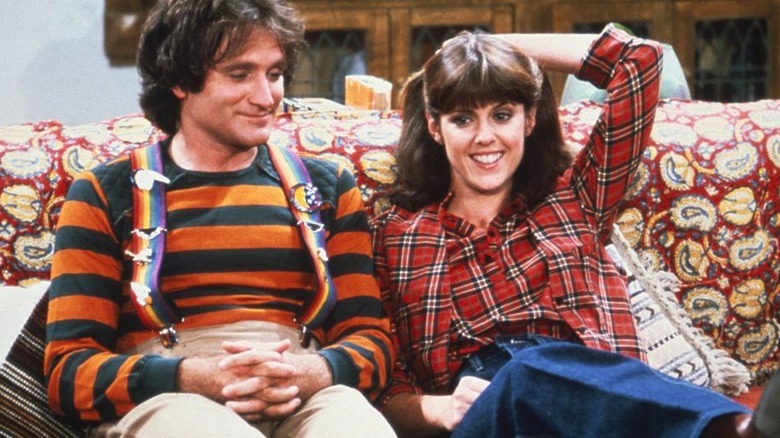 Williams was so loose as Mork from Ork, the impish alien he played on Mork & Mindy from 1978 to 1982, that it felt like the actor improvised a great deal of his lines. That might have seemed especially true to anyone familiar with Williams' free-flowing stage act. The reality is that many comic moments on that sitcom started with the writing staff borrowing bits from Williams' stand-up shows, as well as honing material Williams devised in rehearsal. According to an interview at io9 with Mork writer David Misch, the staff stayed "up until four in the morning" to write Williams' supposed "ad-libs." One time, the script called for Mork to be playing a game of poker… by himself. Williams could certainly handle five different voices, but he had a hard time differentiating five characters from one another in the confines of a two-minute scene. Mork & Mindy episode director Howard Storm suggested Williams change it to just two characters, "an old Jew and an old WASP playing chess." So, Williams acted that out, and the writers wrote it into the script. When Aladdin was in pre-production in the early '90s, Disney animators so wanted Robin Williams to play the Genie — and play him as an unpredictable comic dynamo — that to convince him to take the role, they made a short cartoon of the big blue guy set to a routine from one of the comedian's old albums. He agreed, of course, and while the part was expressly "written" for him, Williams still wildly and prolifically improvised when recording his part for Aladdin. He added in lines, asides, and more dazzling bits — particularly celebrity impressions. "He turned into a game show host, an evangelist. Out came all the celebs — Arnold Schwarzenegger, John Wayne, George C. Scott," supervising animator Eric Goldberg told the Los Angeles Times. Goldberg said he wasn't even sure if Disney would allow all that extra material to be animated, but superiors happily relented. As part of an Aladdin home video reissue in 2015, Disney released some behind-the-scenes footage of Williams' frenetically recording his lines, which sounds a lot like one of those old comedy album routines that started the whole process. Armand ducks into the kitchen to freak out for a minute, then carry the soup pot back into the dining room… only to slip and fall. According to Azaria, Williams' sudden and spectacular tumble was unexpected — the floor was purposely slippery to help facilitate Azaria's scripted pratfalls. But Williams rolls with the moment, not breaking character and getting back up to ensure Azaria's character that, "It's okay, we're alright, it's fine!" Watch closely, though, and it's obvious Williams is trying to stifle a laugh. Inside the Actors Studio, Bravo's long-running cult series, was a bridge from the network's original, high culture programming to the cheesy reality shows it airs today. It found worshipful host James Lipton interviewing masters of the acting craft for the benefit of students at the Actors Studio Drama School of Pace University. Robin Williams showed up for an episode in 2001, no stranger to the rigors of theatrical academia, having studied at the prestigious Julliard School in the 1970s. As is the show's way, Williams submitted to Lipton's many leading questions while also answering ones from the audience of students. Rather than give flat and boring replies, Williams did what he does best — bounce around a stage and make people laugh. There was no way Williams knew what all those young actors were going to ask, so they were less probing queries and more improv-style "suggestions from the audience." To get a spot on The Tonight Show during Johnny Carson's last week as host was a very big deal. Carson, set to retire after nearly 30 years as the undisputed king of late night, was only going to invite on his very favorite, very famous, very entertaining guests. Robin Williams fit the bill, worthy of some of Carson's precious final few minutes on TV. Williams entertained Carson on his final regular episode of The Tonight Show on May 21, 1992. Williams roasted Carson with old man jokes, hitting the stage with a rocking chair for the retiring comedian, and yelling as if he were hard of hearing. From there, Carson and Williams discussed current events, such as the Bush/Quayle White House and the post-Rodney King verdict riots in Los Angeles. And by "discussed" we mean that Williams riffed wildly while Carson looked on, laughing and presumably regretting giving up the job that would allow him to do this kind of thing every night. A few years before he won his first Academy Award, Williams won a couple of Golden Globes, a.k.a. Practice Oscars. After taking home Best Performance by an Actor in a Motion Picture – Comedy or Musical for Good Morning, Vietnam, he repeated the feat for the 1991 film The Fisher King. He beat out some lofty competition, such as his Hook co-star Dustin Hoffman, his dear friend Billy Crystal for City Slickers, and fellow The Fisher King lead Jeff Bridges. Williams' acceptance speech is as pure, perfect, and definitive as a Robin Williams routine as could be. He begins with a mildly ribald joke about the look of the trophy, then segues into an impression of then-president George Bush, commenting on his recent vomiting incident in Japan. Williams then gets around to thanking industry types ("you've heard those names before! "), praising especially Hollywood bigshot Michael Ovitz with a hymn-like musical moment. In the brief speech he also manages to make what he says is a reference to The Silence of the Lambs, calls Bridges a "national treasure," and imitates his other Fisher King co-star, Michael Jeter.